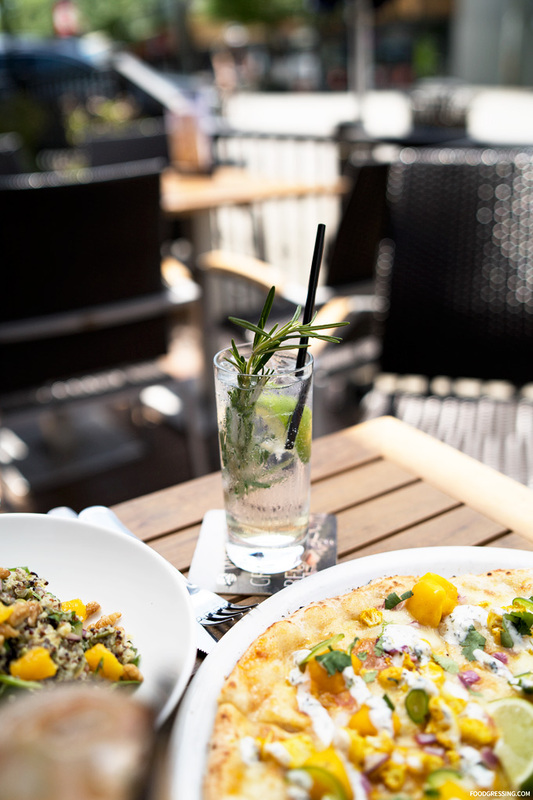 Seasons in the Park New Prix-Fixe Weekday Lunch Menu + GIVEAWAY! 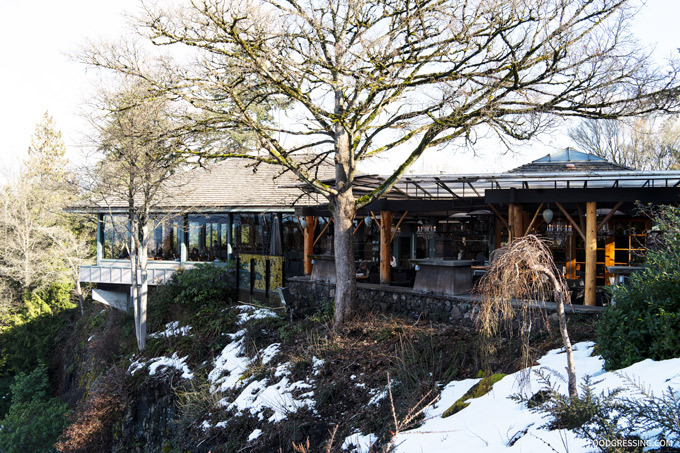 As the weather gets warmer, spend the day at Queen Elizabeth Park and dine at Seasons in the Park – one of the most romantic restaurants in Vancouver. Take in the views by enjoying a special Three-Course Weekday Lunch Menu that’s available Monday to Friday for $39 per person. 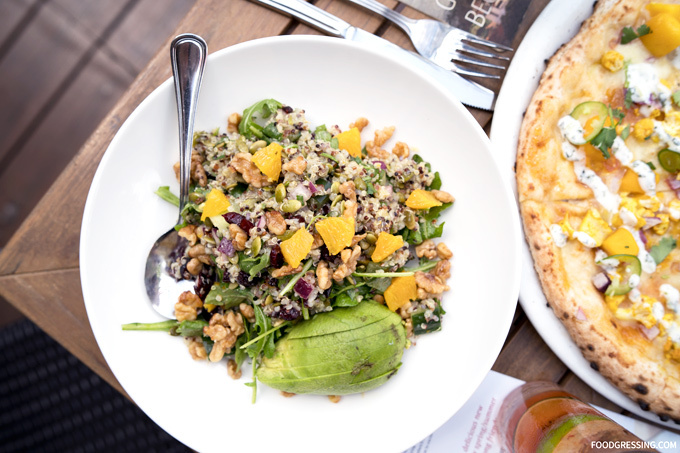 This menu features gluten-free, vegetarian and Oceanwise options. I was recently invited for a media tasting of the new weekday lunch menu. Here’s a look at what you might want to order. 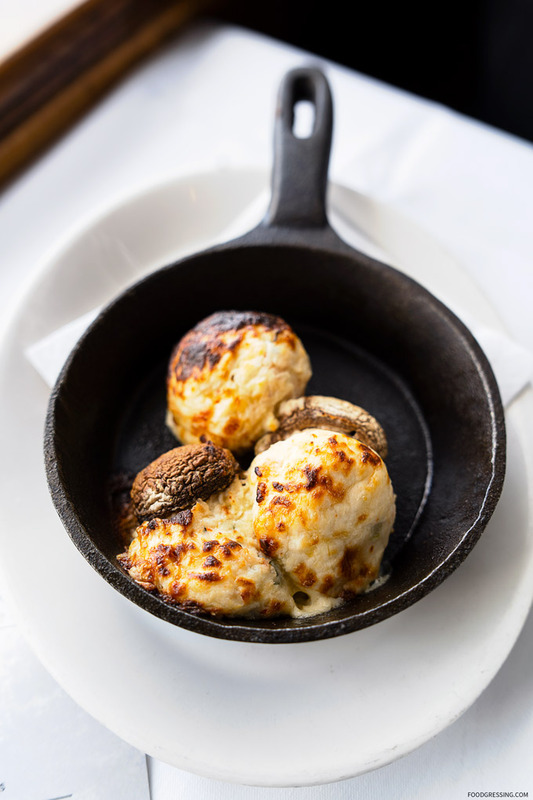 This gluten-free starter features juicy mushrooms prepared with crab, shrimp and cream cheese. 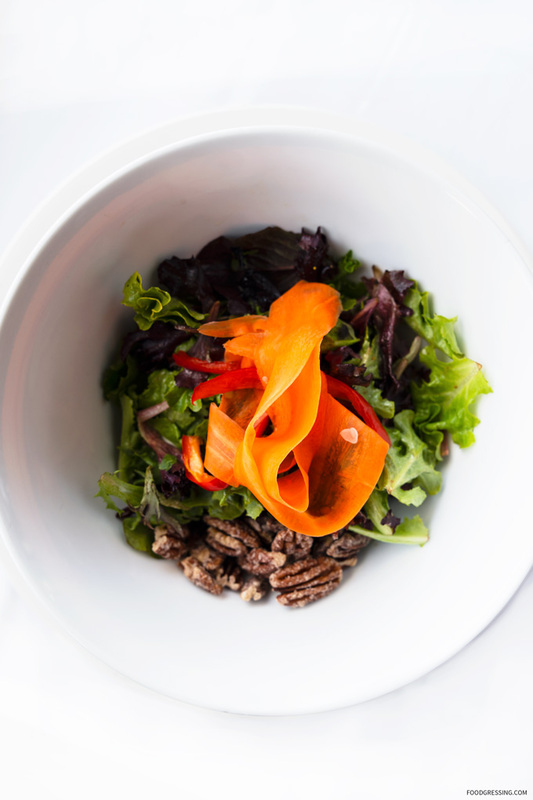 A light, refreshing and vegetarian starter is the market greens salad with fig-balsamic vinaigrette, pickled vegetables, and candied pecans. 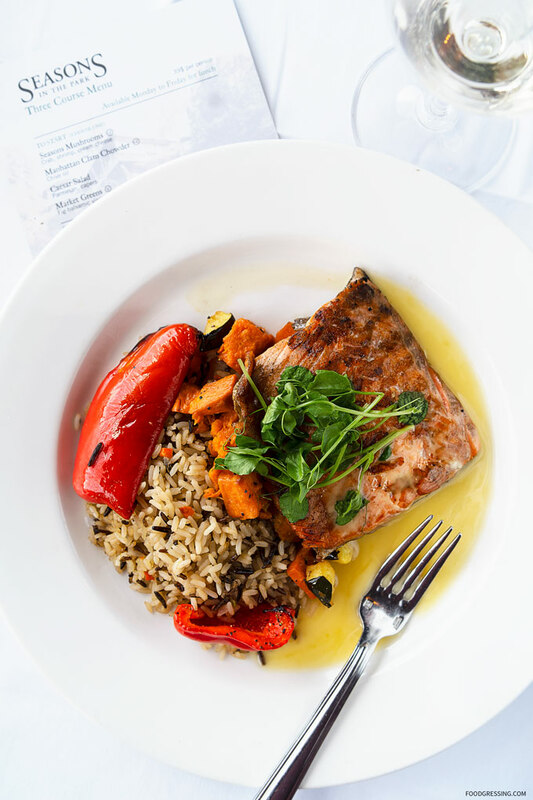 For a seafood main, there is the Oceanwise Grilled BC Salmon (gluten-free) accompanied by maple butter sauce, wild rice, and market vegetables. The recommended wine pairing is Cedar Creek Pinot Gris. 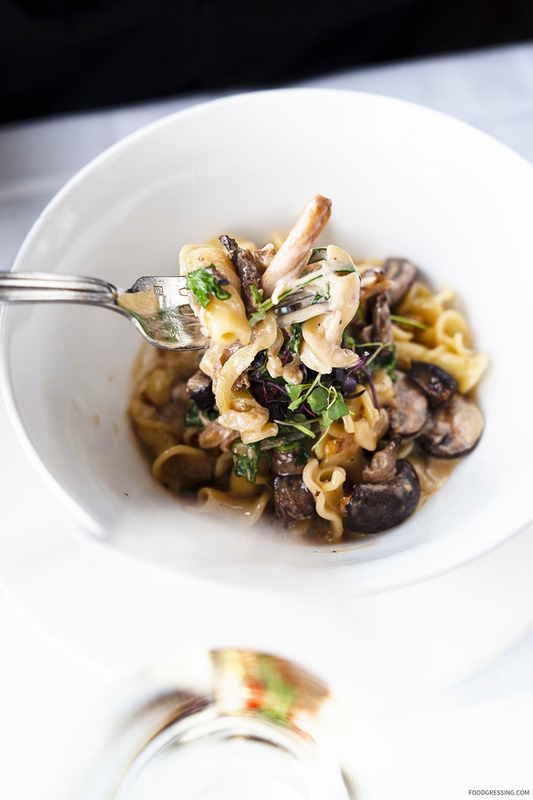 For a vegetarian pasta entree option, there is the mushroom campanelle featuring local mushrooms, walnuts, mission figs, arugula and white wine. It’s a hearty pasta dish with a luscious, creamy sauce. 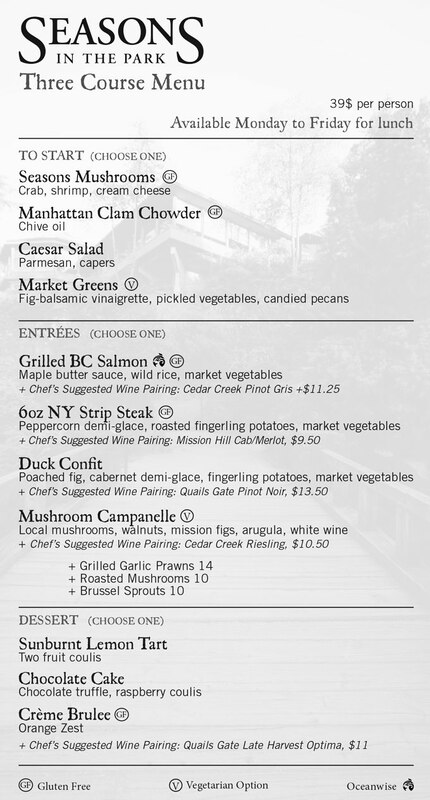 The Chef’s suggested wine pairing is a Cedar Creek Riesling. There are also add-on options to entrees including grilled garlic prawns (+$14), roasted mushroom (+$10) and brussel sprouts ($10). 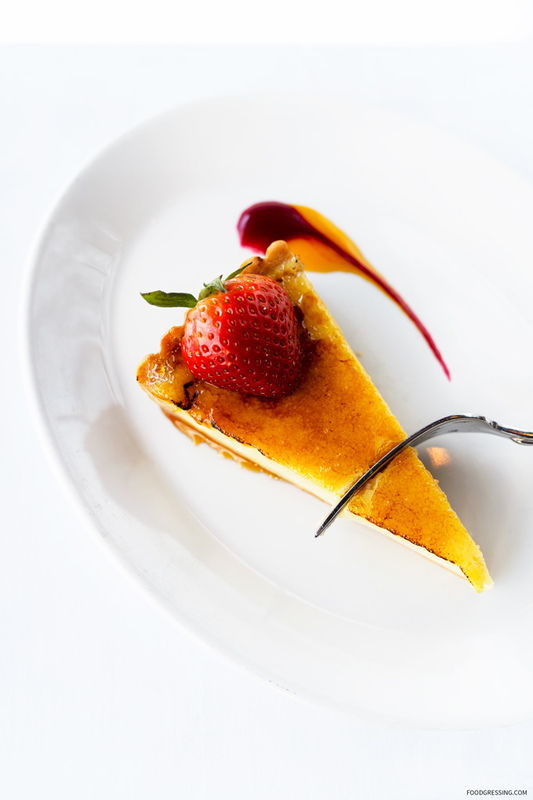 For a satisfying finish to the meal, there is the sunburnt lemon tart with zesty flavours, caramelized top, and a buttery crust. 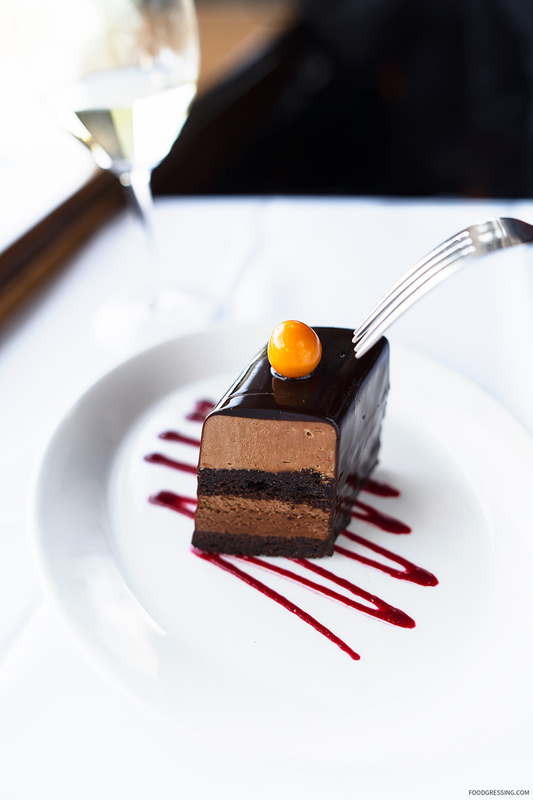 Or if you’re a cake-o-phile, the chocolate cake with chocolate truffle and raspberry coulis is a delicious choice. I usually like to name my choice items for an ideal three-course menu but I enjoyed all the dishes I tried. Any combination in my opinion would be delicious. 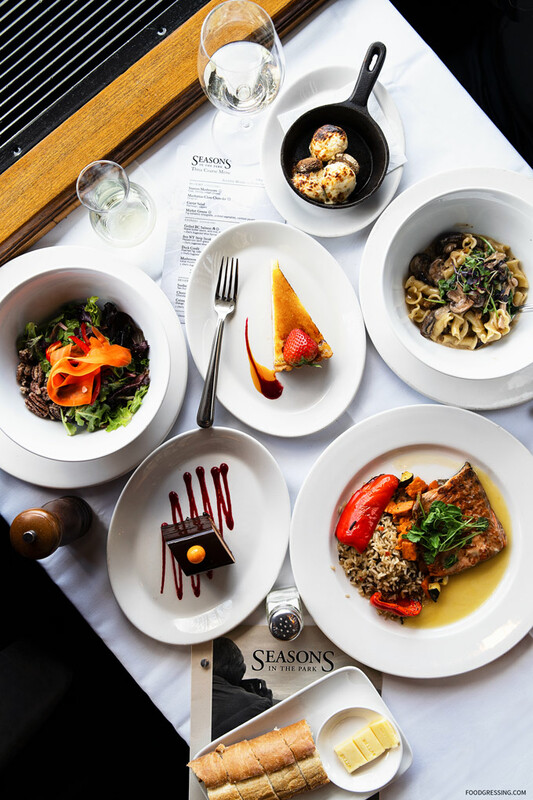 In partnership with Seasons in the Park, I am giving away a three-course prix-fixe weekday lunch for 2. Visit my Instagram for more details! 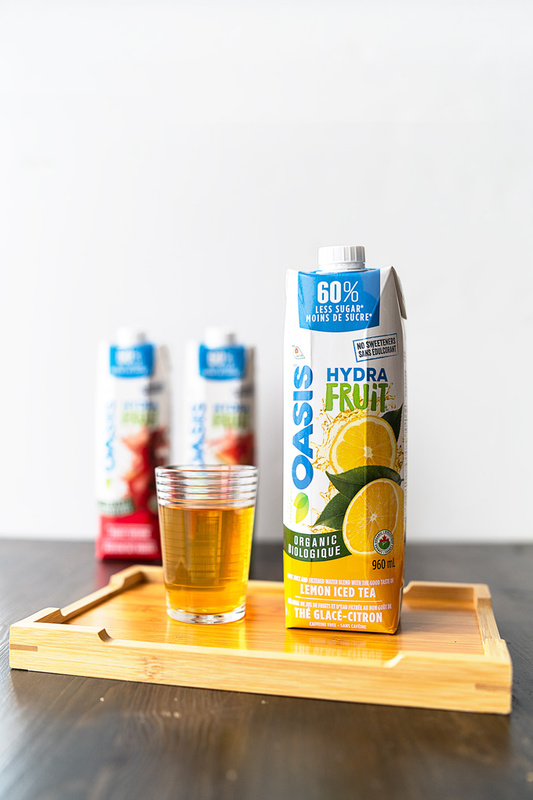 Oasis HydraFruit Organic + GIVEAWAY! We all love a refreshing cup of fruit juice but many juices that are being sold in supermarkets are loaded with sugar. 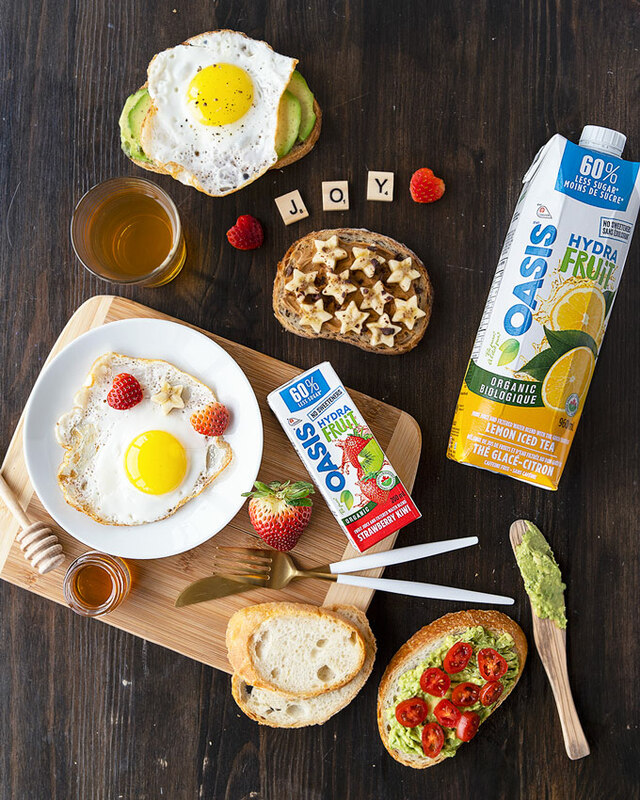 As many Canadians are moving towards better eating habits, the Oasis brand from Lassonde has created a tasty and healthier solution. 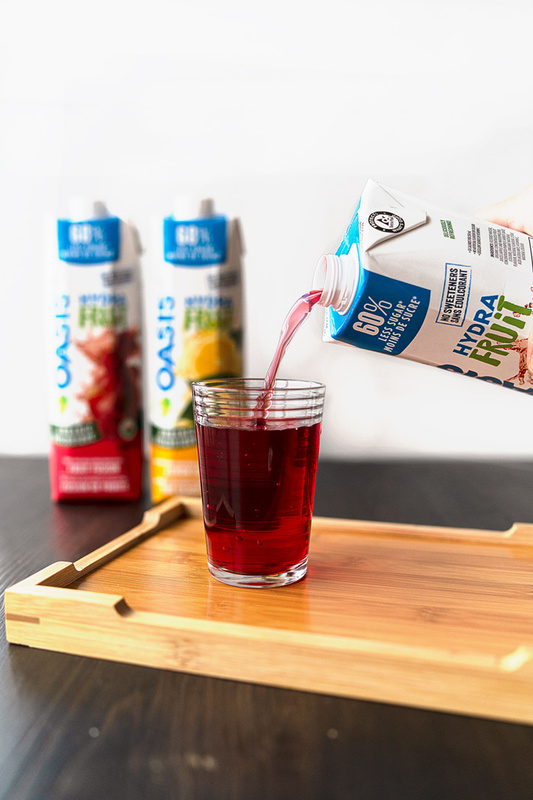 Meet Oasis HydraFruit Organic, a new line of refreshments by Oasis that has 60% less sugar than regular fruit juice blends and is now certified organic. 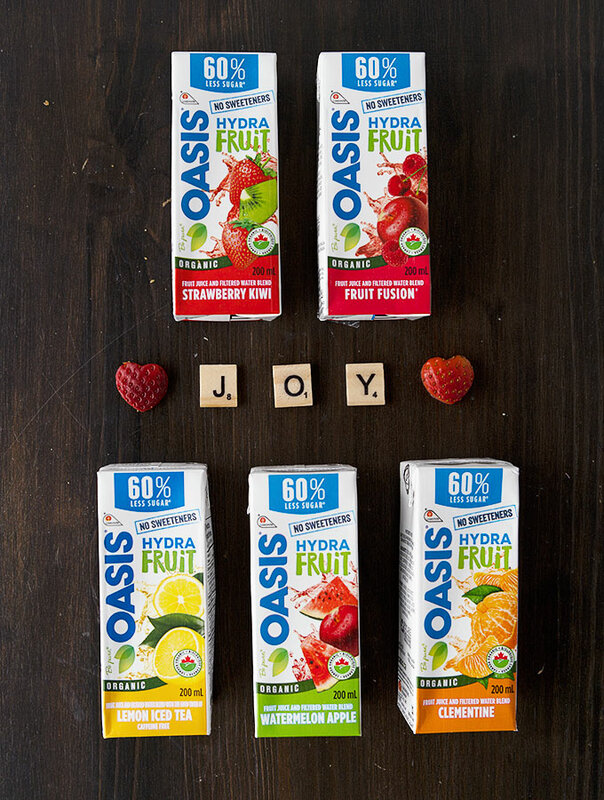 You’ll be excited to know that Oasis HydraFruit Organic beverages contain no added sugar or sweeteners. They’re made up of 50% organic fruit juice and 50% filtered water, for 100% of your recommended vitamin C intake per 250 mL serving. 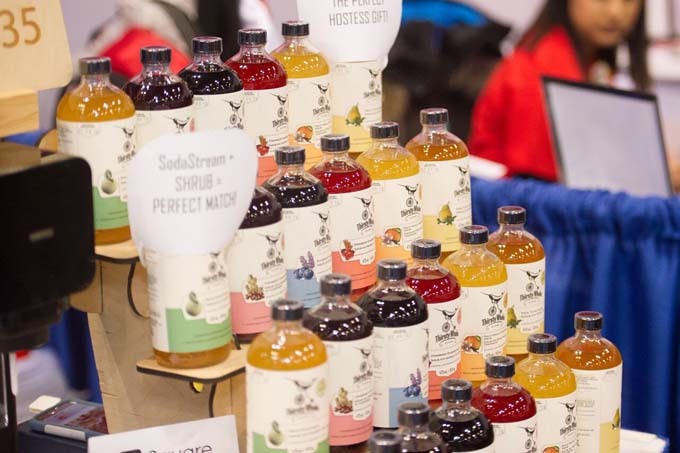 Furthermore, when you purchase Oasis HydraFruit Organic products, you’ll be supporting buying local since they are processed and packaged entirely in Canada. Thanks to Oasis, I was able to try a variety of flavours including Watermelon Apple, Lemon Iced Tea, Fruit Fusion, Strawberry Kiwi, and Clementine. In general, I thought the flavours really tasted like how they were labelled. My favourite was the Lemon Iced Tea which gave me summer vibes; this makes me feel particularly good as it is winter right now. You can find Oasis HydraFruit Organic product in the juice section of the grocery store. They carry the Canada Organic logo and are available at the following suggested retail prices: $1.69 to $2.29 for a 960 mL carton, and $3.49 to $3.99 for a package of eight 200 mL juice boxes. In partnership with Oasis, I am giving one reader/follower a prize pack which includes a $15 gift card, an assortment of Oasis HydraFruit beverage, a reusable grocery tote, an organic lunch box and an organic reusable snack bag. Check out my Instagram post for more details. 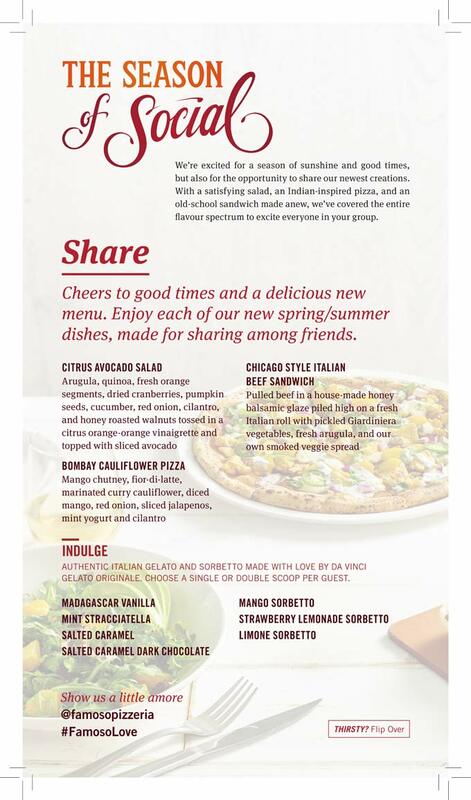 It’s the season of sunshine and Famoso has launched some new spring/summer creations to enjoy during these good times. 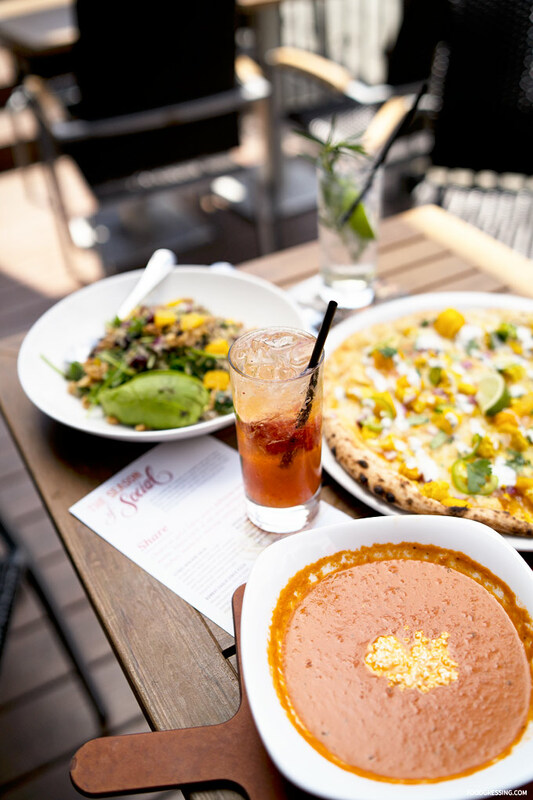 You’ll find a satisfying salad, an Indian-inspired pizza and an old-school sandwich on the new menu. I was invited for a tasting of these new items at Famoso on Commercial Drive where these dishes were developed. 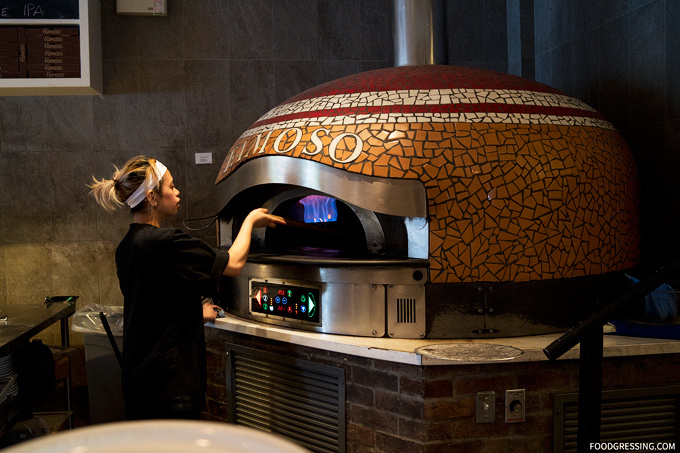 Here’s a look at what you might order on your next visit to Famoso Neapolitan Pizzeria. 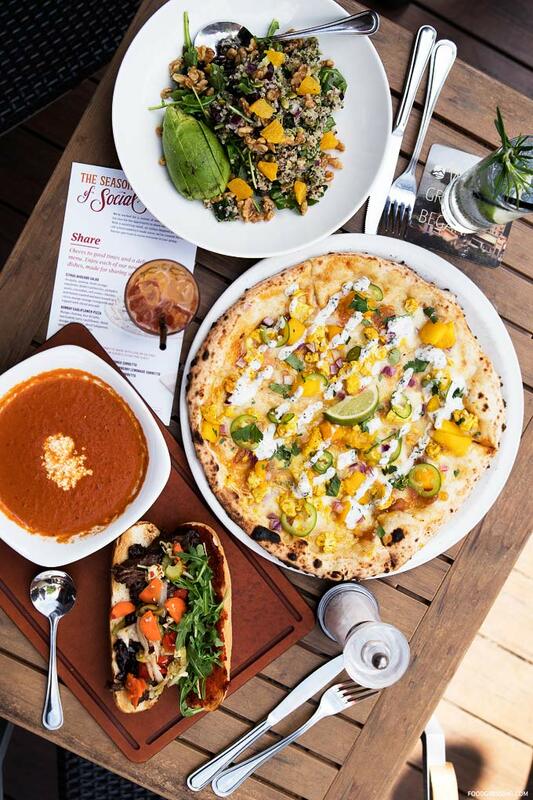 The main dishes (Citrus Avocado Salad, Bombay Cauliflower Pizza, and Chicago Style Italian Beef Sandwich) can be enjoyed individually but sharing with friends is encouraged. 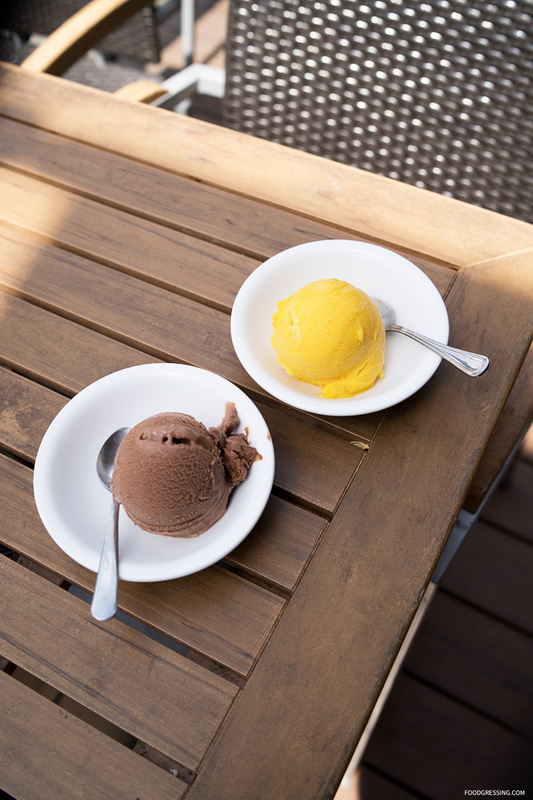 For dessert, there are authentic Italian gelato or sorbetto options available in single or double scoop. 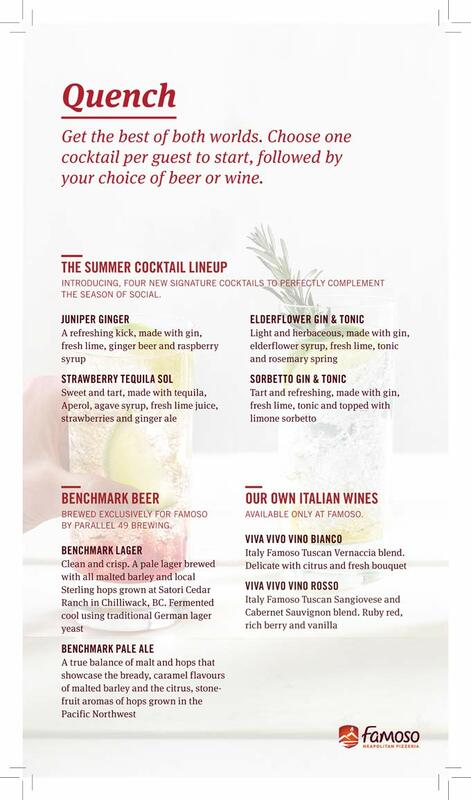 Famoso also has a summer cocktail lineup featuring four new signature cocktails to perfectly complement the season of social. 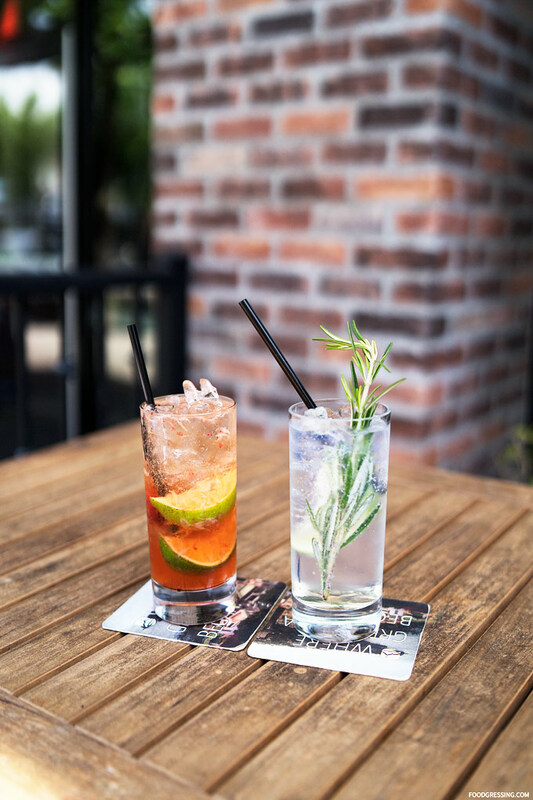 Or you can get the best of both worlds by enjoying a cocktail to start and following up with your choice of beer or wine. To start, my guest and I enjoyed the Strawberry Tequila Sol and Elderflower Gin & Tonic. The Strawberry Tequila Sol was sweet and tart; it was made with tequila, Aperol, agave syrup, fresh lime juice, strawberries and ginger ale. In contrast, the Elderflower Gin & Tonic was light and herbaceous; it had gin, elderflower syrup, fresh lime, tonic and a rosemary spring. We tried all the main dishes: the Citrus Avocado Salad, Bombay Cauliflower Pizza, and Chicago-Style Italian Beef Sandwich. 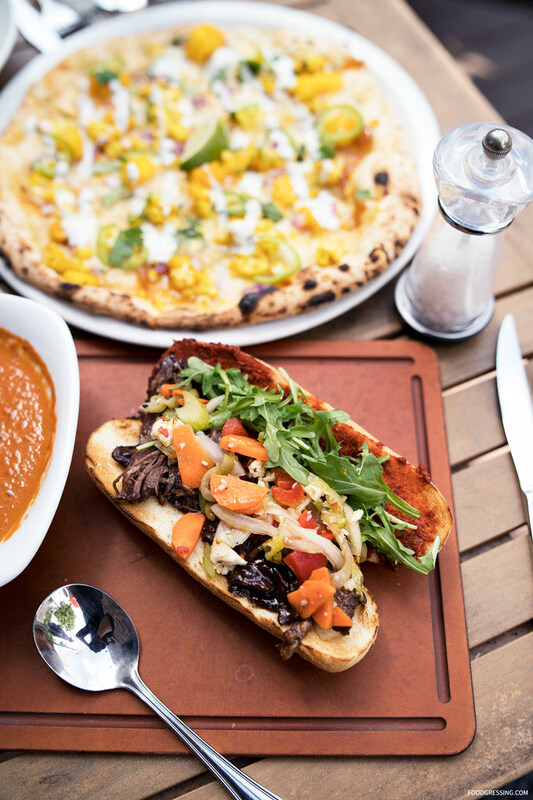 This old-school sandwich was very comforting and featured pulled beef with a house-made honey balsamic glaze in an Italian roll along with pickled Giardiniera vegetables, fresh arugula, and Famoso-smoked veggie spread. The pulled beef was particularly juicy, tender and flavourful. 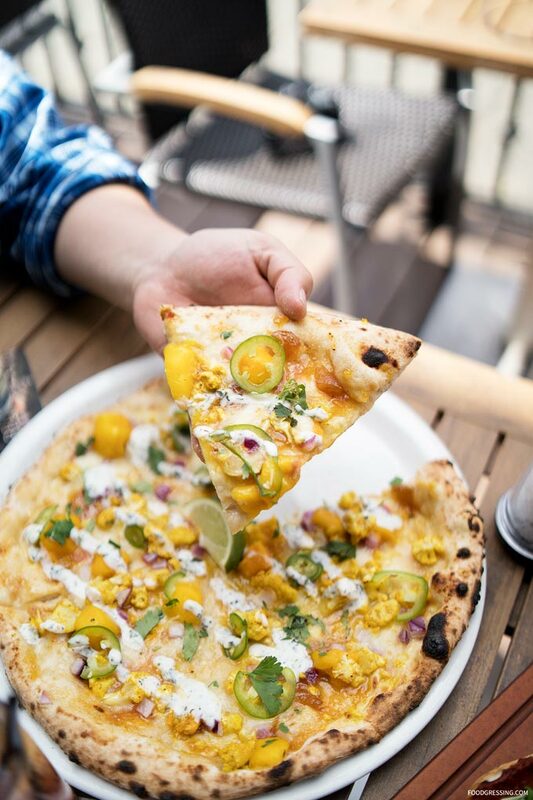 Light and delicious, this Indian-inspired pizza had mango chutney, fior-di-latte, marinated curry cauliflower, diced mango, red onion, sliced jalapenos, mint yogurt and cilantro. The flavours I got from the pizza were sweet, subtly spicy and citrusy. For those who love a nourishing bowl of salad, this Citrus Avocado Salad might just be for you. 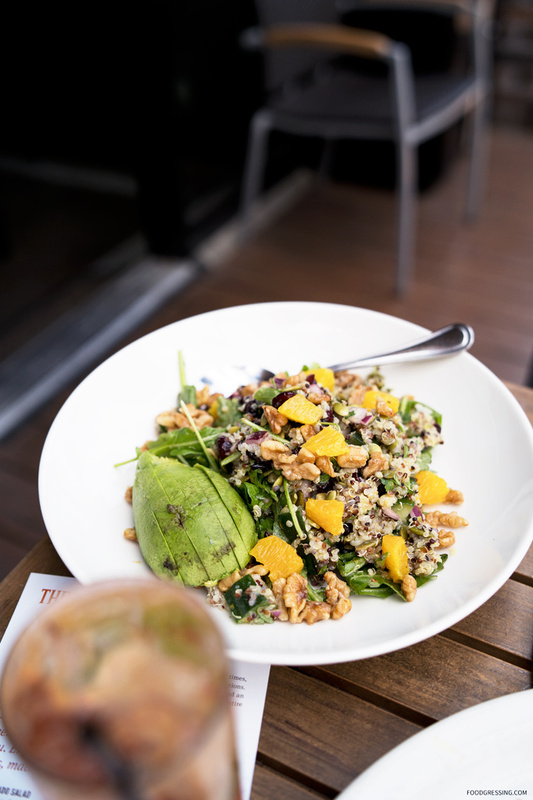 It’s loaded with lots of ingredients like quinoa, arugula, fresh orange segments, dried cranberries, pumpkin seeds, cucumber, red onion, cilantro and honey roasted walnuts tossed in a citrus orange-orange vinaigrette and topped with sliced avocado. The flavours were mostly citrusy, nutty and sweet. And for dessert, we had a delicious salted caramel dark chocolate gelato and mango sorbetto by Da Vinci Gelato Originale. 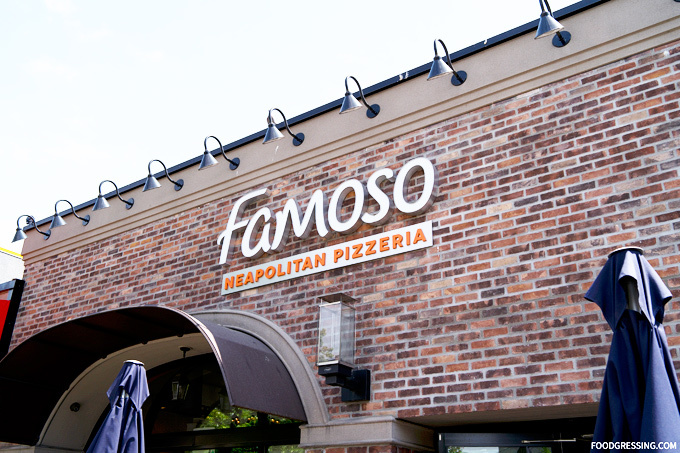 Enter to win a $100 gift card to Famoso to try out this new menu. Giveaway is happening on Instagram and closes Monday, June 11 2018 at 22:59 PST. Open to Canadian residents. Mother’s Day 🌷 is coming up and what better way to show the special woman in your life you love her than to give her the gift of relaxation. Fortunately, with WaySpa, you won’t have the daunting task of finding *the* perfect spa. Mom can choose herself as WaySpa is Canada’s largest spa and wellness marketplace with over 2,000 partner spas. 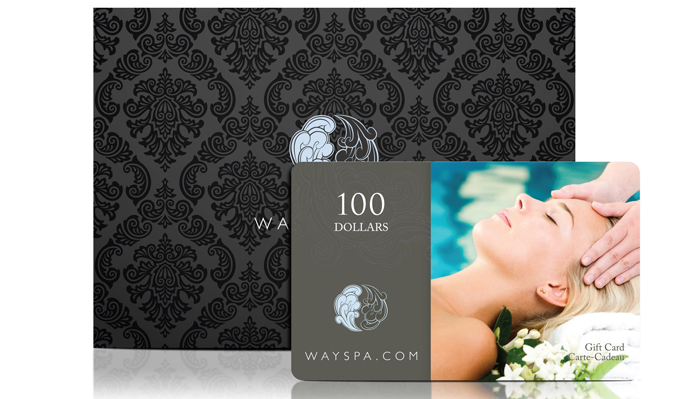 I have partnered with WaySpa to give 1 follower a $100 gift card. This giveaway is happening on my Instagram page and closes Sunday, May 13, 2018 at 23:59 PST. Open to Canadian residents. Good luck! To get more ideas on how mom can pamper herself with WaySpa, visit this post. In today’s 24-7 world, it is hard to keep up a healthy lifestyle especially while trying to maintain or lose weight. Canada’s original meal replacement bar, Nutribar, provide “Nutrition on the Go” by delivering all the essential vitamins and minerals, protein, carbs and fat found in a completely balanced whole foods meal without the required time and energy to prepare it. In comparison to protein bars that are intended as a snack to manage hunger between meals, Nutribar has the optimal nutritional breakdown. Nutribar meal replacement bars are also regulated under Canadian government guidelines and approved by Health Canada. 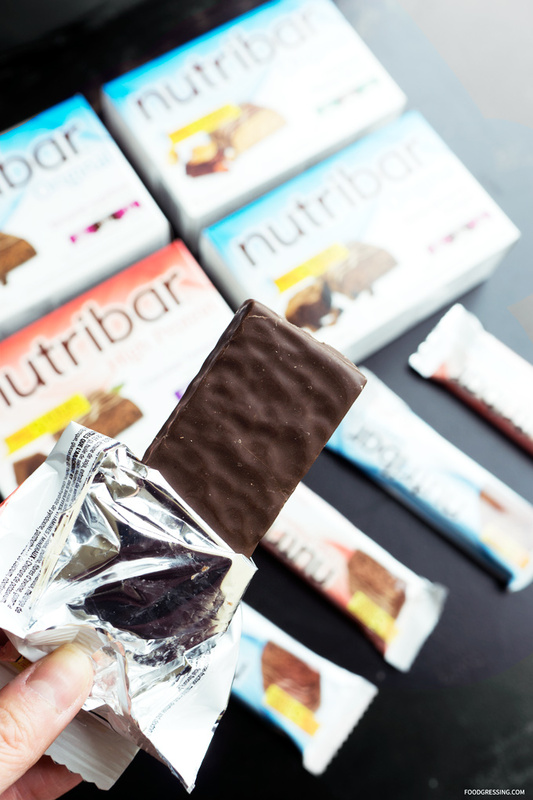 What’s more, clinical studies show that Nutribar meal replacement bars satisfy hunger and cravings for up to five hours, eliminating the desire to snack between meals. Replacing two meals a day with a Nutribar meal bar has been clinically shown to lead to weight loss of up to eight pounds over six weeks. You can achieve an optimal health lifestyle with a busy schedule by combining Nutribar meal replacement bars with healthy, nutritious eating the rest of day as well regular exercise. 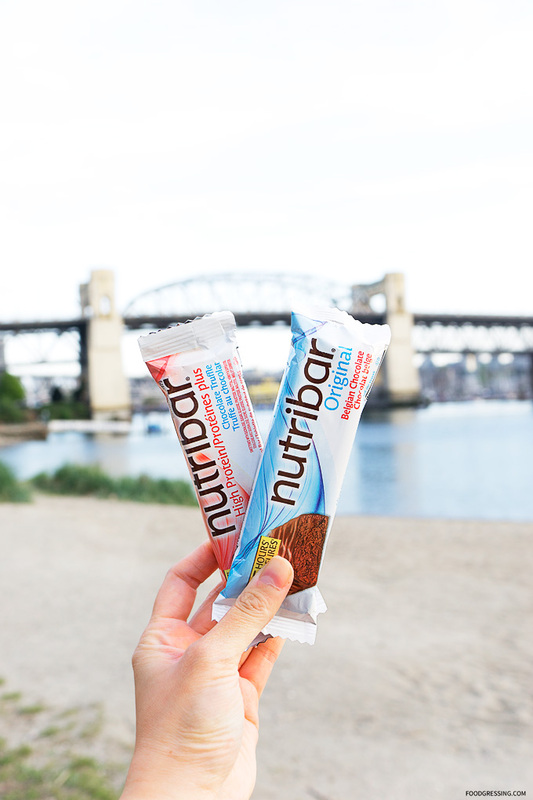 Nutribar meal replacement bars are available in two formats: Original and High Protein for those with a more active lifestyle. Original flavours include Belgian Chocolate, Chocolate Fudge, Chocolate Peanut Butter, Creamy Caramel, Deep Brownie Delight, Hazelnut Vanilla, Mocha Almond and Oatmeal Raisin. High Protein flavours include Caramel Nougat Chocolate Temptation, Chocolate Truffle,Double Chocolate, Milk Chocolate Peanut and Peanut Delight. Retail price is approximately $3 per bar. For a list of retailers, visit www.nutribar.com. As of April, Nutribar meal replacement bars will be available for purchase online at www.nutribar.com. 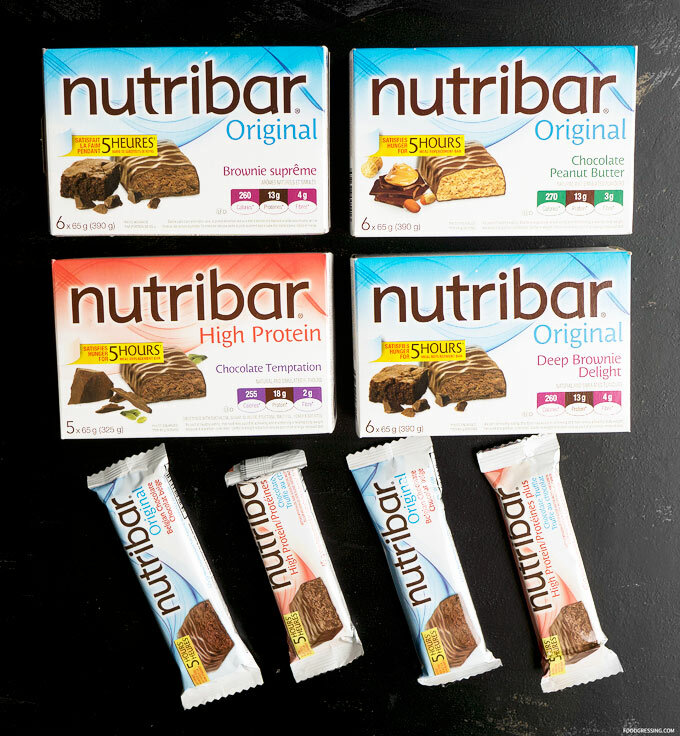 Thanks to Nutribar Canada, 3 winners will each win 5 boxes of Nutribar ($75 value). 2 winners are chosen from the Instagram giveaway and 1 from this blog post. Giveaways end May 14, 2018 at 11:59 am PST. Open to Canadians (excluding Quebec). Disclosure: This post is in collaboration with Nutribar Canada. 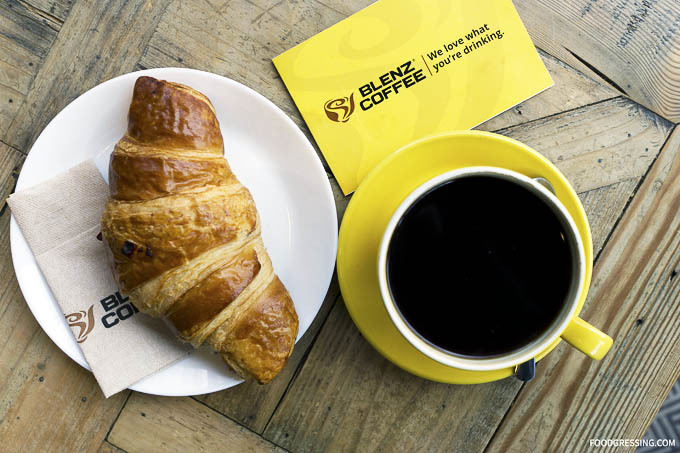 Blenz Coffee Americano Promotion + GIVEAWAY! Blenz Coffee currently has a promotion where their Americanos are the same price as their drip-coffee! Americanos are great for this time of year as they are calorie-free and affordable with this promotion. ALSO, today Feb 15 is FREE AMERICANO DAY at Blenz’s Bentall 5 location (550 Burrard Street, Vancouver). 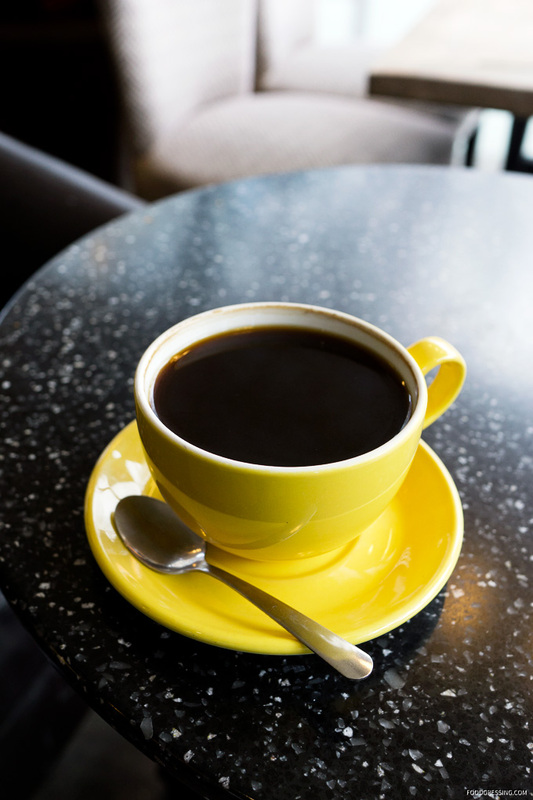 In order to get a free Americano, customers will have first sample of a drip coffee versus an Americano, so that they can ‘taste the difference’. Thanks to Blenz Coffee, I am giving two winners each win a $20 Blenz gift card. The giveaway runs on Instagram and ends February 21, 2018 11:59 PST. Good luck! 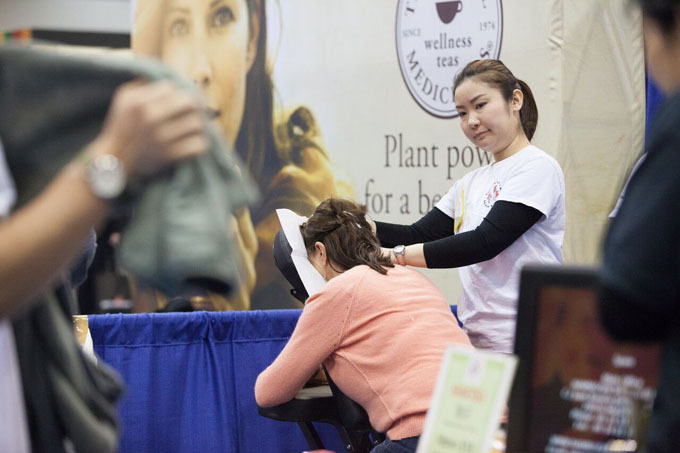 The 2018 Wellness Show returns February 17 & 18 at the Vancouver Convention Centre with the goal of helping Vancouverites achieve their healthiest, most holistic selves. This year’s show includes more than 250 exhibitors, 100+ speakers, cooking and fitness demonstrations. For more than a quarter of a century, The Wellness Show has been helping residents of the GVRD discover the latest trends in nutrition, fitness, physical and emotional well-being. 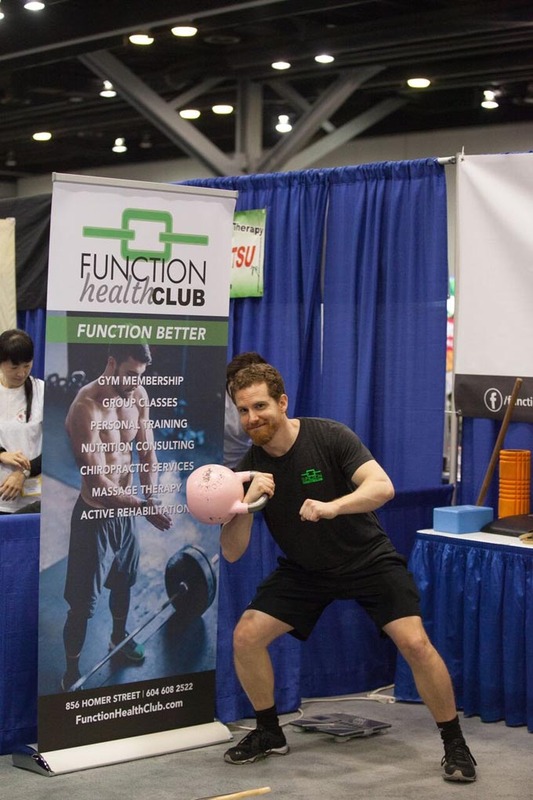 The Wellness Show includes exhibitors, speakers and demonstrations on a diverse range of health and wellness topics, including nutrition, exercise, beauty, healthy aging, alternative and holistic therapies, mental well-being, healthy kids and green living, all under one roof, and for one low ticket price. Healthy Families featuring “The Green Mama” talking about healthy pregnancies, as well as workshops on bolstering your family’s immunity, and recipes for a vegan diet. Celebrity Cooking Stage featuring Chef Phil Scarfone of Nightingale, Robert Clarke of The Arbor, Shelome Bouvette of Chicha, and the one and only Tojo. On Saturday, February 17, join Tosca Reno (best selling author & health expert), Lori Joyce (CEO at Betterwith Foods) , and Aeryon Bela Ashlie (fitness expert & coach) for the Women Empowering Women Panel sponsored by Fresh Magazine. Table Tennis is an Olympic sport, and the second most popular racquet sport in the world. Experience the physical and mental benefits of Table Tennis and try it out for yourself at The Wellness Show. There will be 4 regular tables, one junior table, and one mini table for the little ones, as well as professional players and coaches to teach you more about the sport! 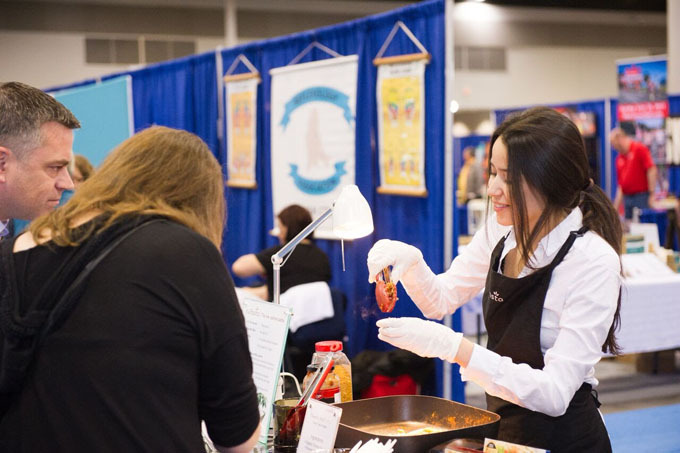 There’s always lots to see, do and eat at The Wellness Show! Last year over 20,000 visitors came through our doors, and of those attendees, the vast majority spent a minimum of 4 hours exploring, sampling and learning. Location: Vancouver Convention Centre East (Old Convention Centre), 999 Canada Pl, Vancouver in downtown Vancouver. Tickets: $14.50 General Admission, $12.50 Seniors 65+ / Students with valid ID, $6.00 Children (5 and under free), and $20.00 2 – day, all access pass. Tickets are available online at thewellnessshow.com, or at the door. 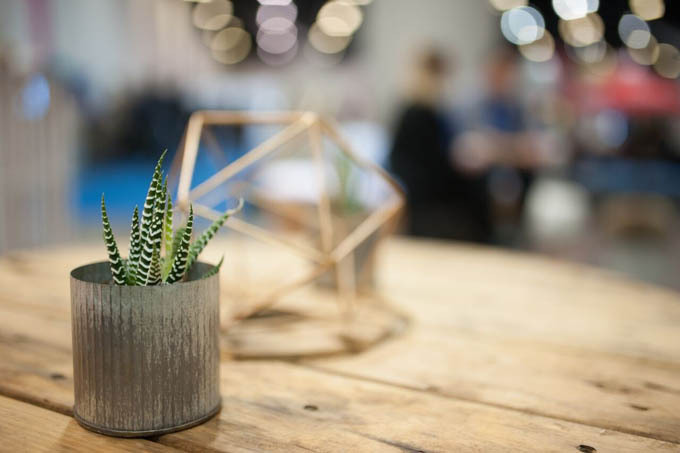 Thanks to the Wellness Show, I am giving one winner two tickets to this year’s show and a swag bag. Giveaway ends Feb 11, 2018 23:59 PST. Open to Metro Vancouver residents. Starting today, Starbucks Canada has a new item to make your breakfast-on-the-go even more healthy. 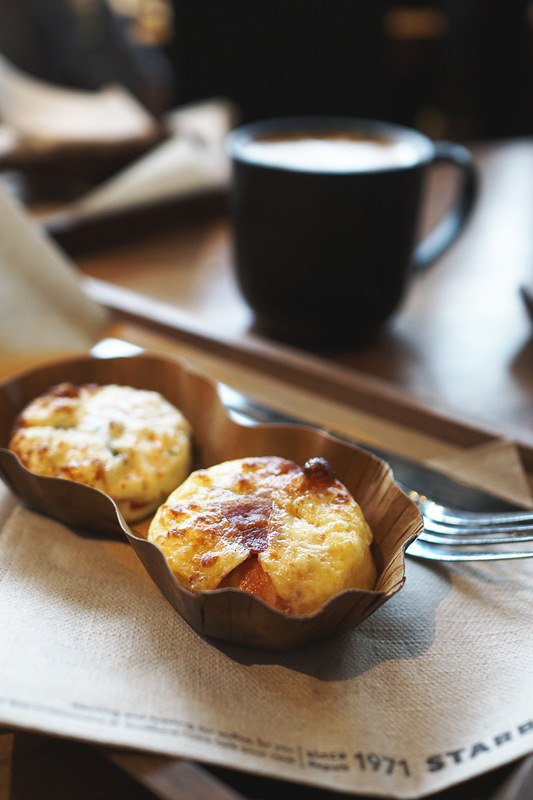 Meet Starbucks Sous Vide Egg Bites – perfectly cooked, cage-free eggs prepared using the French “sous vide” technique. The Sous Vide Egg Bites were introduced to the US market last year (I had seen them myself while visiting Seattle) and just became available in Canada today. I attended a media tasting this morning to try out these non-bread, breakfast goodies. Disclosure: I attended a media tasting. Opinions are my own. Sous-vide (pronounced “soo veed”) means “under vacuum” in French and is a cooking technique where vacuum-sealed food is immersed in water and cooked at a very precise and consistent temperature. Sous-vide is preferred method because it doesn’t require extra fats and oils. According to Starbucks, the result of cooking the eggs sous-vide is a creamy, velvety texture with flavour that is rich in flavour. It’s as if you’re eating something indulgent but you’re not. 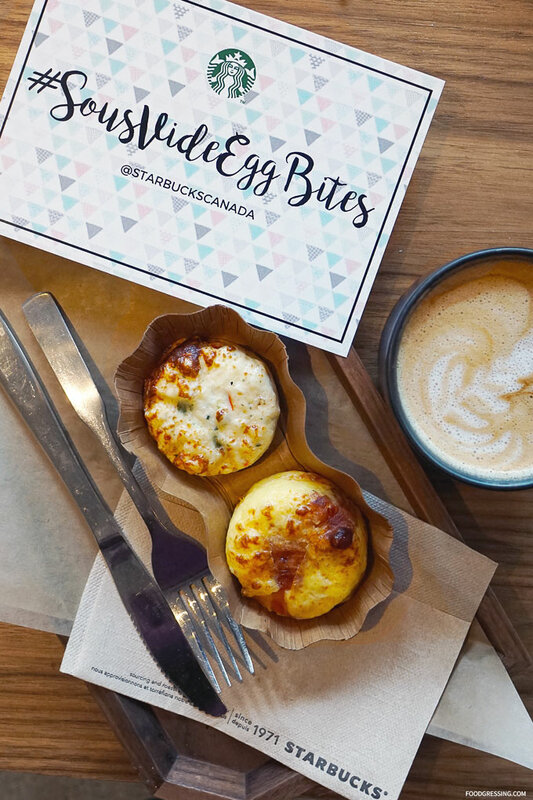 Starbucks Sous Vide Egg Bites are available in two savoury flavours: Bacon & Gruyere and Egg White and Roasted Red Pepper . This flavour features aged Gruyere and Monterey Jack cheese, and topped with Applewood smoked bacon. Two Bacon and Gruyere bites are $4.75 and have 310 calories and 19 grams of protein. This flavour has creamy Monterey Jack cheese, plus spinach and fire-roasted red peppers. Two Egg White and Roasted Red Pepper bites are $4.75 and have 170 calories and 13 grams of protein. At first bite, I really loved the texture of the sous vide eggs. They’re wonderfully spongy and creamy which is a good kind of addictive. Of the two flavours, I enjoyed the Bacon and Gruyere because it was more flavourful. The taste of cheese was quite prominent and the bacon was appropriately smoky and salty. Those seeking a healthier , vegetarian option would enjoy the Egg White and Roasted Red Pepper. It’s a lot lighter in taste due to being made with egg whites only. From a nutritional standpoint, the Egg White and Roasted Red Pepper also has less fat (7 g vs 22 g) and less sodium (500 g vs 600 g) than the Bacon and Gruyere per serving. All in all, these new items are tasty, low-carb and high-protein on-the-go breakfast options. I would gladly order these again as well as recommend them to others. 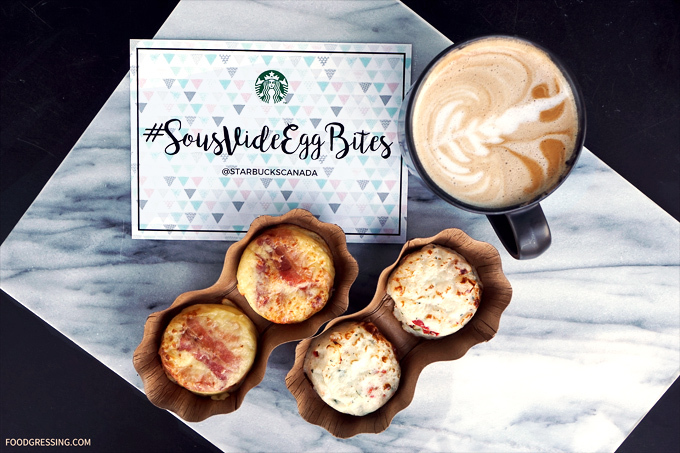 Thanks to Starbucks Canada, I am giving 2 winners each a $20 gift card to try out the Starbucks Sous Vide bites. Open to all Canadians. Giveaway ends January 23, 2018 23:59 PST. 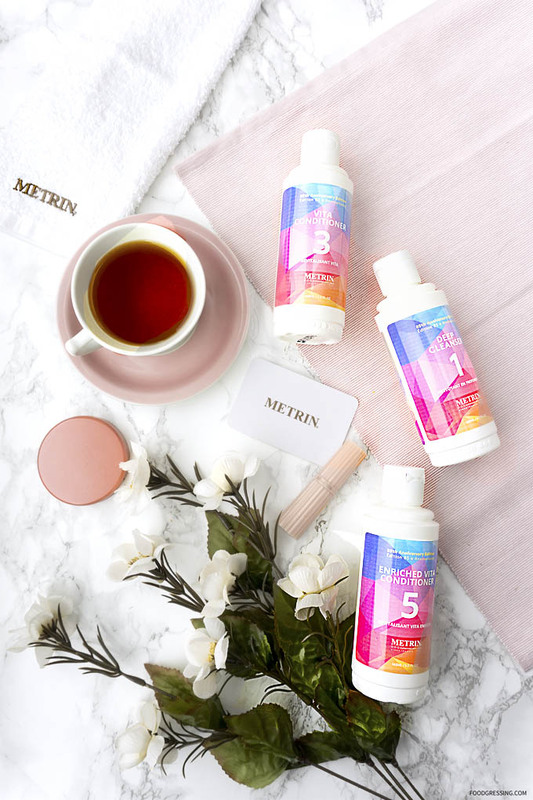 Metrin 5-Step Skincare System + GIVEAWAY! With the number of skincare products on the market and new ones emerging every day, it’s hard to think that there is any product that has been longlasting. However, one local skincare line has had the same formula for 85 years since it was developed in 1932. 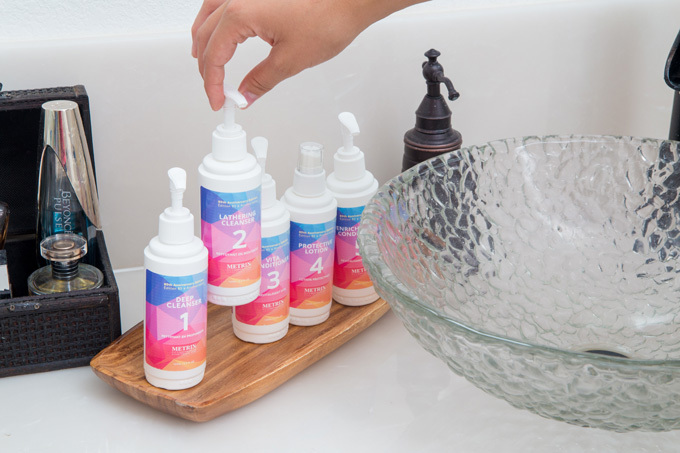 Meet METRIN Skincare System – an independent brand based in Vancouver with products proudly made and distributed in B.C. Unlike other companies, they don’t typically introduce new products or use trendy ingredients. In fact, METRIN’s formulation has been largely intact since inception. METRIN’s Skincare System is designed to be safe and effective for people of all ages, genders, and ethnicities. Their products are formulated without fragrances, dyes, or gluten, and not test tested on animals and contain certified organic ingredients. The Hers skincare system has 5 steps whereas His system differs slightly with 4 steps. For best results, it is recommended that the 5-step Women’s skincare system be used twice daily (once in the morning and once at night). A full-size skincare system typically lasts 6 months depending on usage. Most users start to show signs of clearer, healthier skin after 6-8 weeks of use. METRIN’s formula is designed to work with your skin’s natural renewal process to help it be at its best. This is particularly important as skin changes with age due to a decrease in estrogen levels. Because of that, it’s important to have a skincare system rich in nutrients and essential fatty acids. Disclosure: I received a complimentary METRIN skincare system for the purposes of this review. All opinions are my own. After trying out the METRIN skincare system, I discovered several things I liked about them. First of all, I enjoyed that the system comes with all that you need which is rather convenient. The price point for a Women’s system at $152 CAD which includes 5 bottles is quite affordable compared to what is sold at cosmetics stores. I thought that my skin felt nicely cleansed without feeling too dry and that the conditioners and lotion rehydrated the skin well. I’m interested to see what the results will be like long term. METRIN products can be purchased online at Metrin.com. They ship products around the world including Canada, United States, Japan, Hong Kong, Saudi Arabia, New Zealand, Australia, Malaysia, and the United Kingdom. Thanks to METRIN, I am giving away one skincare system valued at $152 (Women’s) or $136 (Men’s). The giveaway is open to US & Canada and closes November 13, 2017 23:59 PST. Cookbook Review: Portland Cooks + GIVEAWAY! 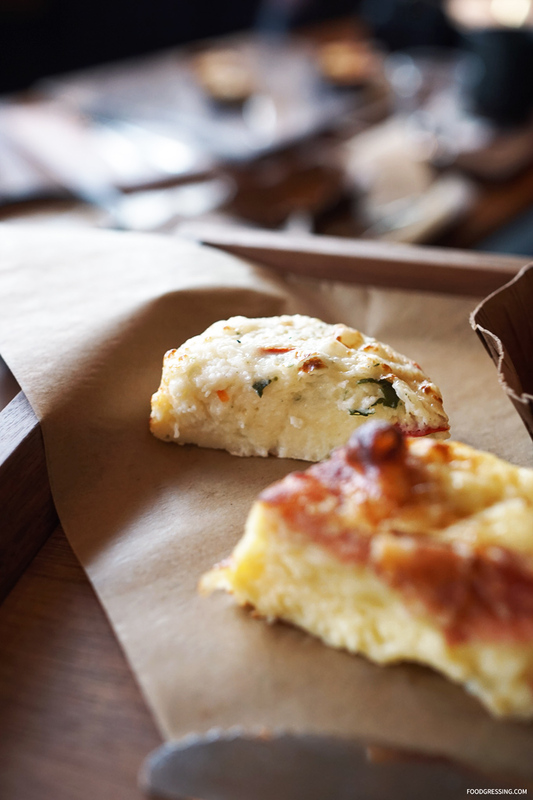 Last month’s visit to Portland was full of fun-filled foodie-licious adventures. 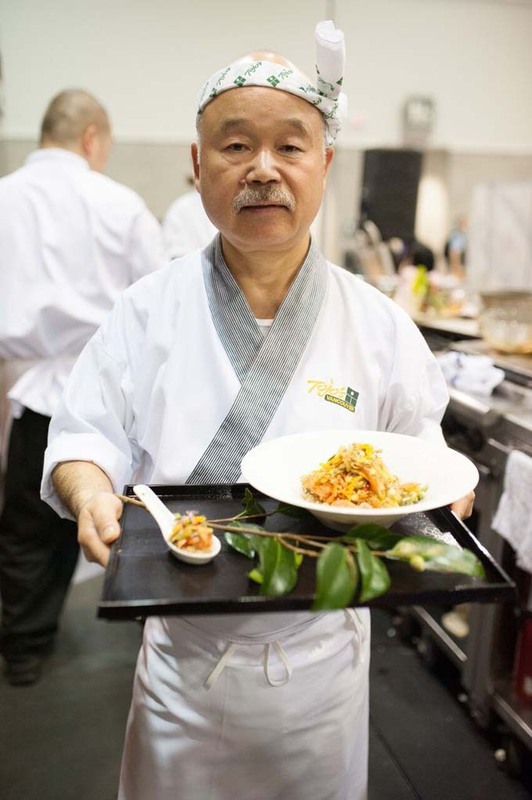 I was able to immerse myself into Portland’s amazing food culture through Feast! Portland – their annual food festival presented by Bon Appetit – and through visits to restaurants around town. It was at an event that I had the chance to meet Danielle Centoni, a James Beard Award-winning food writer, recipe developer, and cookbook author. Prior to meeting her in person, I had read one of her articles in Bon Appetit entitled, “The Best Healthy Restaurants in Portland.” So when I ran into her, it was nice because I had read some of her fantastic work already. 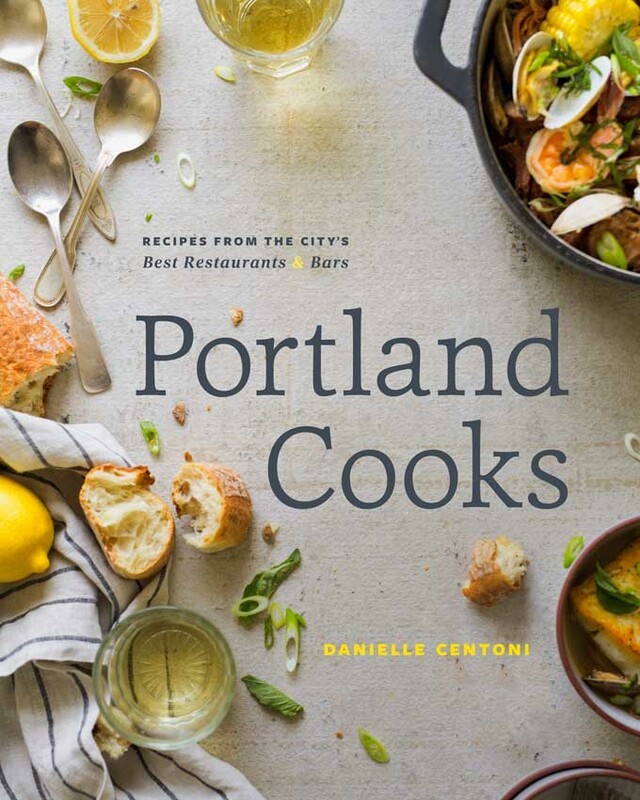 Danielle recently published Portland Cooks – a book that celebrates the talented culinary community in Portland. The book features 80 recipes from 40 of the city’s favorite restaurants, cafes, and cocktail bars. 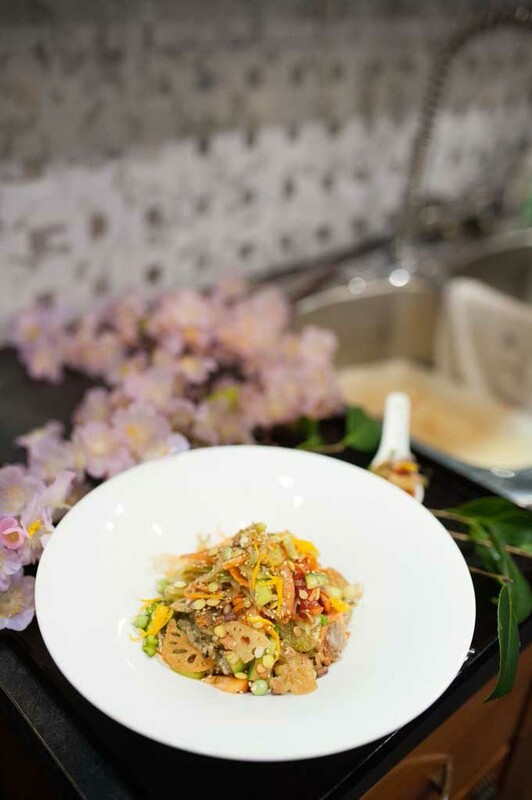 Some of the mouthwatering recipes include Troy MacLarty’s (Bollywood Theater) Roasted Beets with Coconut Milk, Curry Leaves and Indian Spices as well as Alex Yoder’s (Olympia Provisions) Pan-Roasted Halibut with Shrimp, Clam and Andouille Stew. Most recipes are weeknight friendly while others are weekend adventures; they’re all designed with the home cook in mind. It’s the kind of book which appealed to me as a person who loved dining out in Portland and can now recreate some of those experiences and style of cuisine at home. A recipe by Tyler Malek of Salt & Straw and Wiz Bang Bar | Copyright 2017 by Danielle Centoni. Republished with permission from Figure 1 Publishing Inc.
Tyler says that of the hundreds of ice cream flavors he’s made, this is one of his absolute favorites. 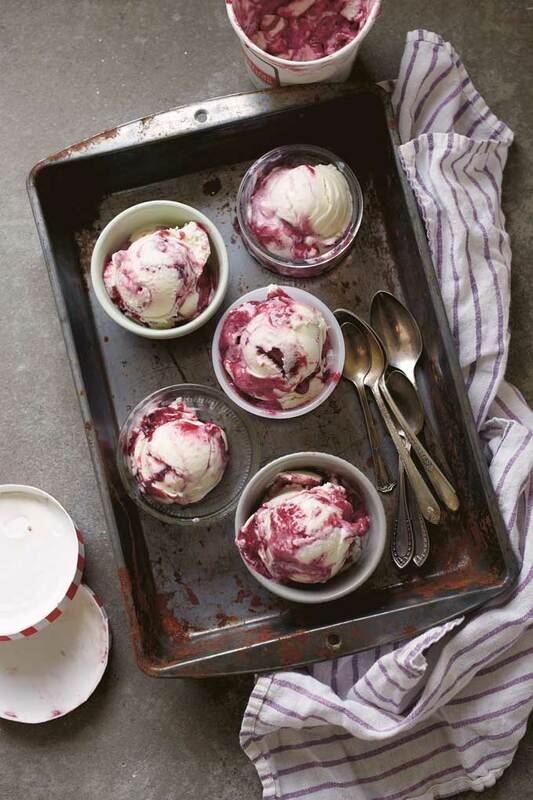 He stirs tangy, creamy, ultrafresh Portland Creamery goat cheese into the base and ribbons the ice cream with a sweet, yet fiery, marionberry jam. The more seeds you leave in the habaneros, the hotter the jam will be, though it mellows quite a bit when frozen. Combine the sugar and xanthan gum in a small bowl. Combine the milk, evaporated milk, and corn syrup in a medium pot (off the heat). Whisking vigorously, slowly mix the sugar mixture into the milk. Don’t worry if the xanthan gum causes a few lumps, but try to whisk hard enough to get the sugar and gum mixed evenly. Set the pot over medium heat and cook, stirring constantly, just until the mixture is hot and the sugar is completely dissolved. (Try to avoid simmering—you’re just trying to melt the sugar and give the xanthan a head start in activating.) Allow the milk mixture to cool to room temperature. Stir in the cream and refrigerate until well chilled, at least overnight but preferably 24 to 48 hours for a better texture and milkier flavor. Combine the berries, habanero, lemon juice, and pectin in a pot, smashing the berries to release some juices. Cook over medium-high heat, stirring occasionally, until the mixture begins to simmer. Stir in the sugar, bring the berries back to a simmer, and cook for another minute. Remove from heat and puree with a hand blender, food processor, or regular blender with the lid ajar, or just mash thoroughly with a whisk. While still hot, strain through a fine-mesh strainer to remove the seeds. Refrigerate overnight. Mix the ice cream base with goat cheese and salt, mashing as needed to break the cheese up into the cream. Add lemon juice to the ice cream base and immediately transfer to the ice cream maker. Churn the ice cream base according to the manufacturer’s instructions until it’s the texture of soft-serve. Flip the container upside down and store in the coldest part of your freezer for at least 12 hours to harden before serving. (We flip the container so that it’ll create an airtight seal on the top, keeping the ice cream super-fresh.) When ready to serve, allow the ice cream to sit out at room temperature for about 5 minutes until scoopable. Note: Xanthan gum helps keep ice cream from forming ice crystals, which would ruin its smooth and creamy texture. It’s often used in gluten-free baking, so look for it in the baking aisle or near gluten-free products. Bob’s Red Mill is a common brand. Thanks to Figure1 Publishing, I am giving away one copy of Portland Cooks. Giveaway is open to US and Canada and ends Oct 31, 2017 23:59 PST.